Whether singing on the stage or giving a speech to a large audience, stretching your vocal folds, also known as vocal cords, allows you to reach your full vocal potential without risking injury. A singer's voice is, after all, her instrument, and damaging vocal folds can lead to temporary or permanent loss of voice, sometimes requiring surgery. With proper warmup, you can reduce risk of damaging the vocal folds, which consist of two bands of smooth muscle tissue in the larynx. While each voice is different, a minimum of seven minutes of warmups are typically needed to properly stretch. Stretch your neck by rolling your head around in a circle. Move your jaw around, loosening your facial muscles. Massage your neck and face with your hands. The point is to release tension and get to a state of relaxation. Stretching other body muscles with shoulder rolls, back stretching and bending over also aid in relaxation. Gently stretch your tongue, either with your fingers or simply sticking it out, to relax your tongue and open your vocal path. Breathe deeply, inhaling for four seconds, then exhaling for four seconds. Pant like a dog or hold your hands on the diaphragm to feel it expanding outward while breathing deeply. Hum the letter "m" and slowly raise the pitch. Then lower the pitch. This massages the vocal folds. Purse your lips and force air between them to perform "lip bubbles" or "motorboats" with your mouth, which increases blood flow to your vocal folds and surrounding muscles. Sing an arpeggio, like "do-re-mi-fa-so-la." Repeat the process, trying to increase your range without straining your voice. This will stretch your vocal folds each time you go higher and lower in your range. Or try singing a single note and hold it. Sing it again, raising the pitch as high as is comfortable. Return to the beginning pitch. Continue to raise and drop the pitch as many times as you can on one breath. 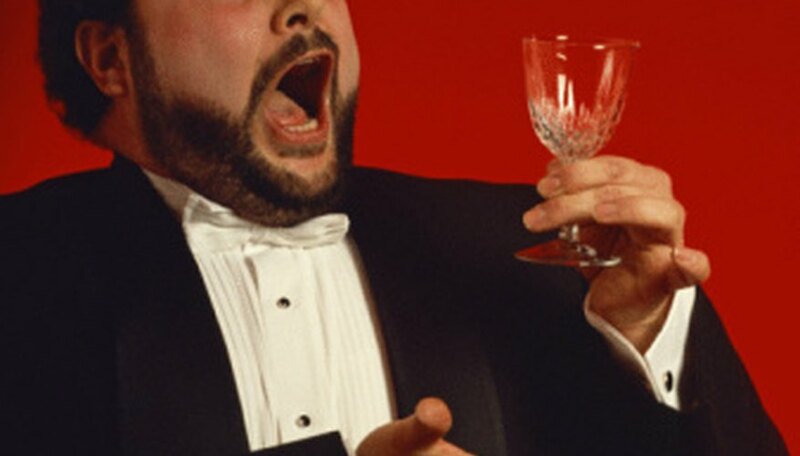 Drink plenty of water to lubricate your vocal folds. Perform warmups daily to keep your vocal cords relaxed. Use your voice less before a concert or speaking engagement. Stay away from milk and other dairy products, which can create mucus. Avoid shouting and heavy throat clearing. Avoid singing in a tessitura, which pushes you toward the extremes of your own range.